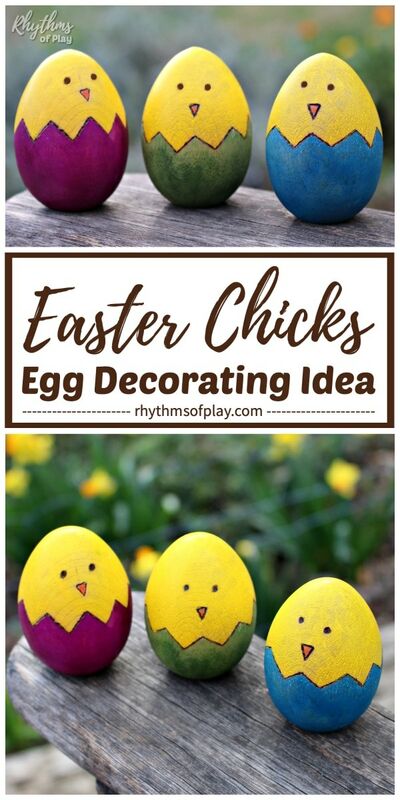 Easter chick egg decorating idea for Easter or the spring equinox. A wooden Easter egg craft idea for older kids, teens, and adults. Children love to find colored Easter chicks in their Easter Baskets as much as they love to find them on Easter egg hunts! Easter chick wooden Easter eggs also make gorgeous DIY spring home decor. Learn how to make this spring chick Easter egg craft idea two different ways with the easy step-by-step tutorial below. 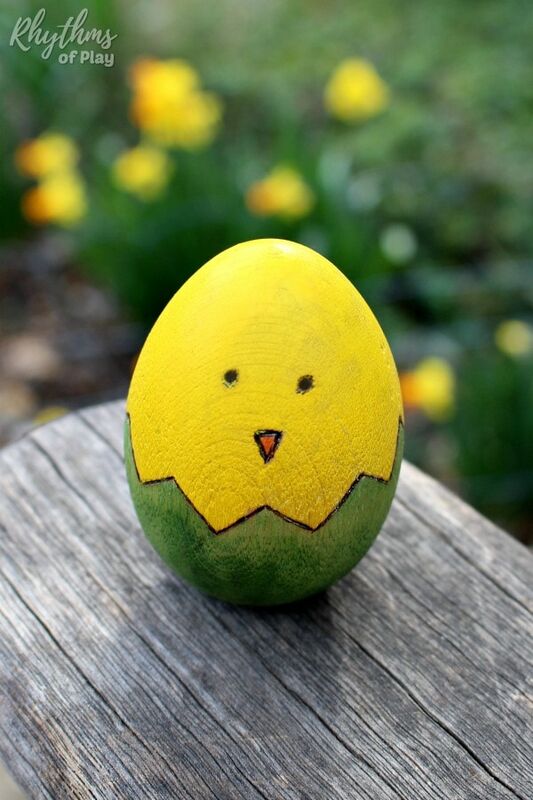 This colored Easter chick wooden egg craft was originally designed as an easy woodburning and watercolor craft project. Another easy way to complete this wooden Easter egg decorating idea is with extra fine tip paint pens . Step by step directions for both versions are given below! Or, you can create this baby chick design on real eggs with paint pens. Just click on the link for all the details! Working with a woodburning pen is as easy as drawing with a hot pencil. It’s also a lot like adult coloring–a wonderful way to relieve stress while making something beautiful. For more woodburning craft ideas have a look at You + Me + LOVE and this gorgeous Celtic heart tutorial with printable art template. Below we have given step by step directions to complete this Easter chick craft a few different ways. The technique you choose will determine how you move through the steps below. Make sure you read through the directions in their entirety before starting this Easter egg craft. Use a pencil to draw a jagged cracked egg line around the circumference of the wooden egg. Next, make a small triangle for the nose. Last make two dots for eyes. If you will be using extra fine tip paint pens to create your design we recommend starting with this step (step 1) and skipping to step 3 before moving back to step 2. Related: Easter Art Projects Kids LOVE! Step 2 – Draw Easter chick designs with a paint pen or use a woodburning pen to etch the design into each wooden egg. NOTE: If you choose to work with paint pens, you may want to do this step AFTER you paint the egg with watercolors. Move on to step 3 and come back to step 2 after your wooden Easter egg dries. Trace pencil designs on wooden eggs or freehand the Easter chick design right onto each wooden egg with an extra fine tip paint pen or a woodburning pen . Simply, trace or draw the basic Easter chick design with either craft tool onto the wooden eggs. If you choose to work with a woodburning tool, I recommend practicing for a bit if you have never used one. You will also need to make sure you take proper safety precautions around children. Woodburning pens are hot and dangerous craft tools! If you used a woodburning tool to create your Easter chick design, we recommend using watercolors to complete your baby chick Easter eggs. Working with watercolors and wooden eggs is easy. The color soaks right in displaying vibrant colors filling in woodburning designs almost effortlessly. You can use either concentrated liquid watercolor paints , watercolor tubes to paint your wooden eggs and complete this egg decorating project. Use liquid watercolors straight out of the bottle or, Squeeze a small amount of a watercolor paint from a tube into a small bowl–you won’t need much. Next, dip your watercolor brush into the watercolor paint just like you would with solid watercolors. You may need a bit of water if you are using watercolor paint straight from a tube. DO NOT use a watercolor pallet for this DIY wooden egg project. They can not provide the rich color that watercolor tubes and concentrated liquid watercolors can. 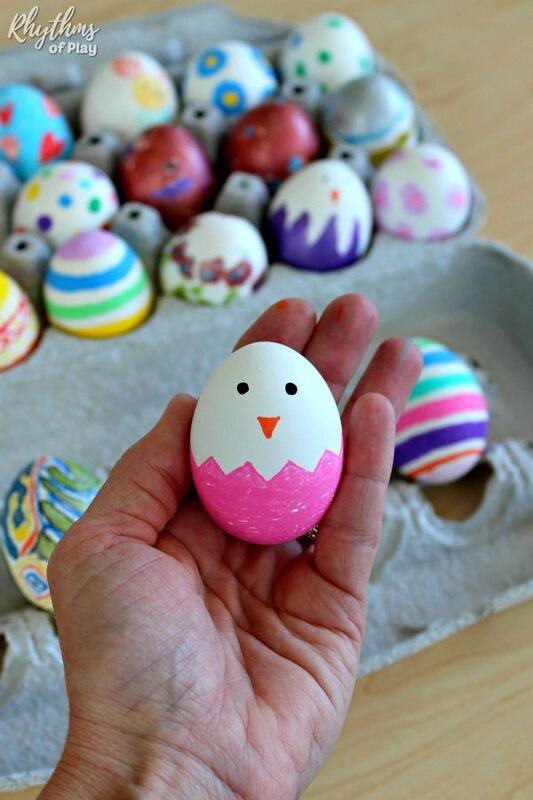 If you used a paint pen to create the Easter chick design, you can choose to color your Easter eggs with watercolor paints, or extra fine tip paint pens . If you choose to use watercolors, you may want to paint the egg before using a paint pen to draw the cracked egg, eyes, and beak. Otherwise, painting over the paint pen design may cause the colors to bleed. Find more tips and examples in Paint pen Easter egg decorating ideas! We used food and child safe beeswax to seal and protect these spring Easter Chicks when I made them for the first time many years ago. I don’t recommend it if you want lasting color. The colors have faded quite a bit over time. The watercolors will also bleed if they get wet. Apply a sealant with a foam brush for lasting color protection. 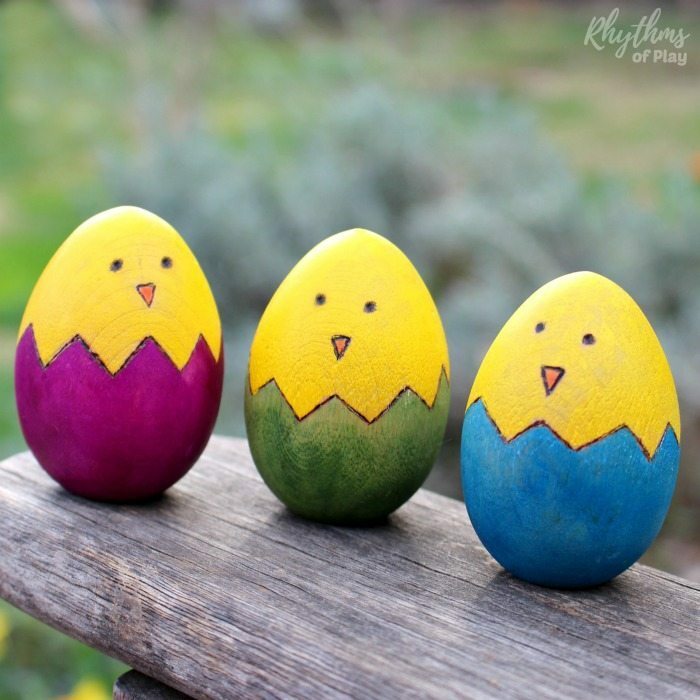 Decorated wooden eggs like these cute Easter chicks are fun to use as spring home decor. Decorate your home for Easter or the Spring equinox by placing wooden eggs on mantles, window sills, and Spring Nature Tables. Fill children’s Easter baskets with Easter chicks and other decorated wooden eggs. Children LOVE to find Easter chick wooden eggs peeking out of Easter Baskets on Easter morning! 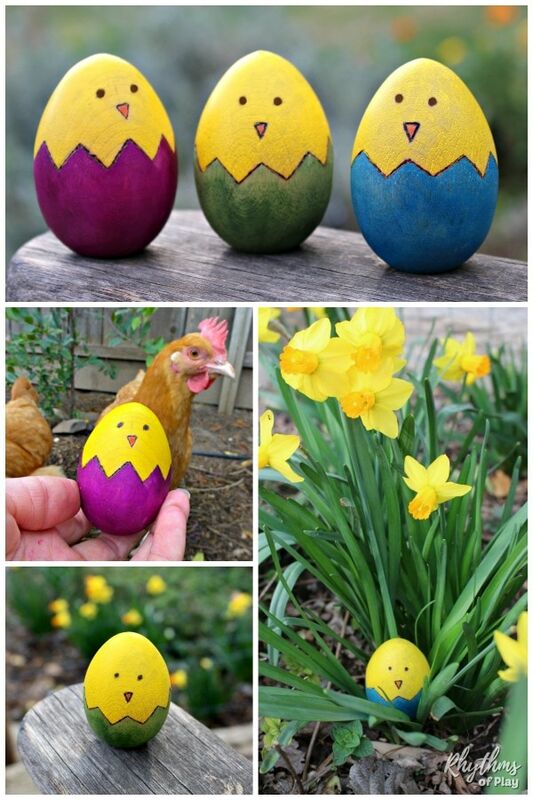 Hide Easter Chicks and other wooden eggs for Easter egg hunts. Decorated wooden eggs are better than plastic eggs filled with candy, for both the health of our children and our planet! 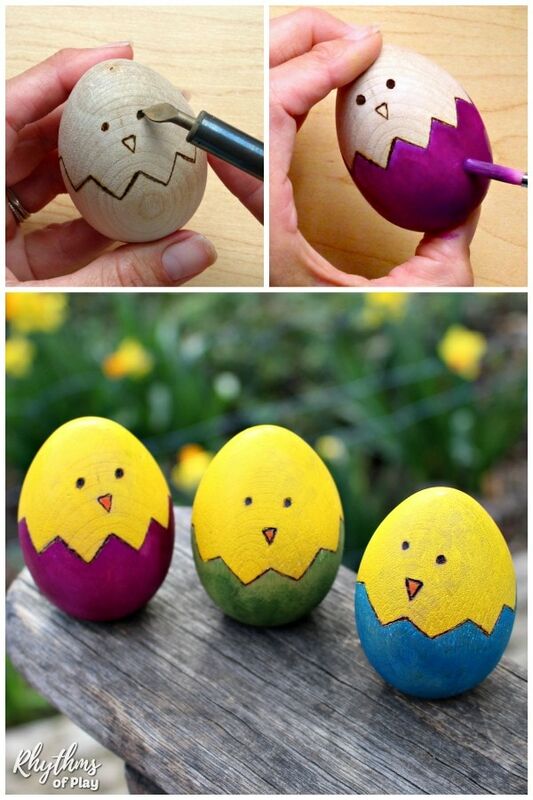 Use colored Easter chicks with wooden egg cups as a DIY baby toy. Placing a wooden egg into an egg cup is a great hand-eye coordination activity for babies six months to 2 years. I would have never guessed how much toddlers would enjoy this activity, but they do! First, show a sitting baby or toddler how to put the egg in the cup and take it out of the cup. Next, invite them to give it a try! Related: Best Baby Toys that Boost Development Naturally! 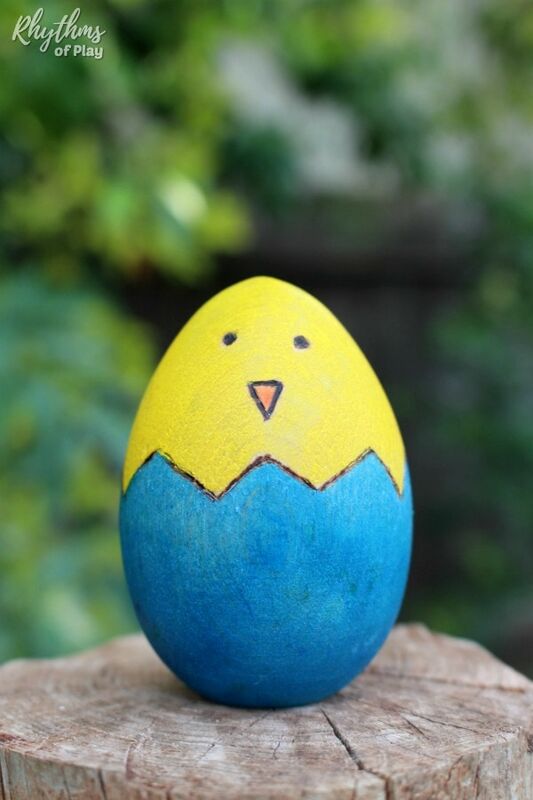 This colored Easter chick wooden egg craft is a fun and easy egg decorating idea for kids, teens, and adults to make for Easter or the spring equinox. 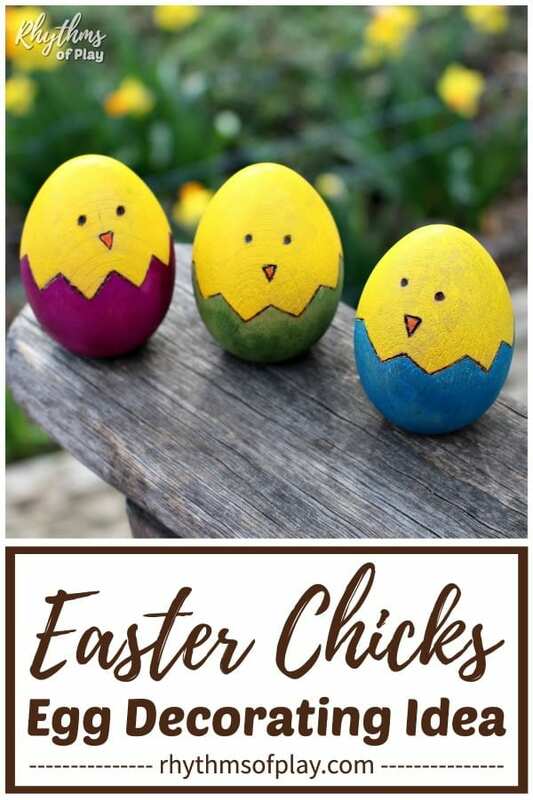 Easter chicks make wonderful DIY spring home decor, look cute when displayed on spring nature tables, and are a perfect alternative to plastic candy-filled eggs for Easter baskets and Easter egg hunts! 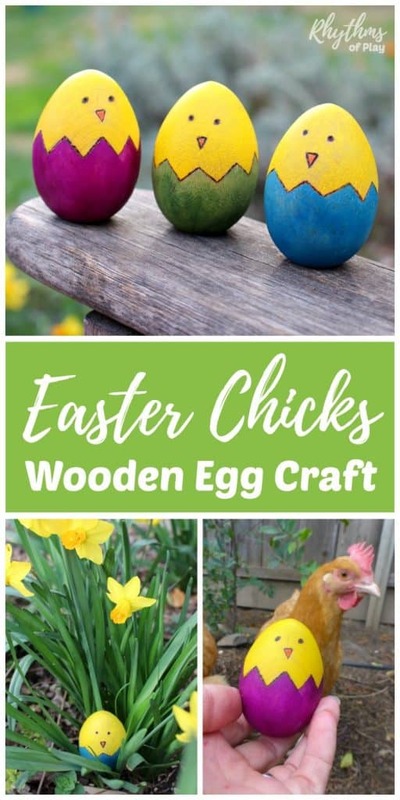 For a few more awesome ways you can decorate wooden eggs for Easter check out The Best DIY Wooden Easter Egg Decorating Ideas. If you have ever wondered how Easter eggs, Easter baskets, and the Easter bunny have come to be associated with Easter, hop on over to learn some interesting theories in Fun Family Easter Traditions. These are adorable! I’ve always wanted to try wood-burning but thought it would be too difficult. I have to admit, you make it sound easy! Thanks Emma! It is easy! I thought it would be hard too before I gave it a try. It’s easy, fun, and very meditative. I love it! I’d love to hear about your experience if you decide to give it a try!